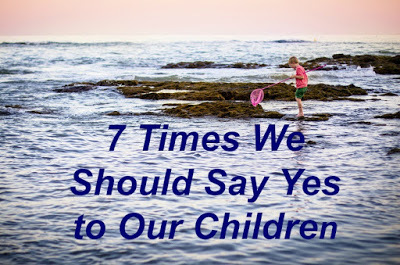 Have you ever caught yourself automatically saying “no” when your child asks to do something? Now, there are many times when “no” is an appropriate answer. When they’re toddlers, it’s “no” to touching numerous things around the house. As preschoolers, it’s “no” to one more cookie when they’ve already had three. With school-aged children, it’s “no” to playing one more game before bedtime, and with teenagers, it’s often “no” to watching that movie or going to a particular place. As often as possible, say “yes’ to…. 1. Creativity. This first one may be the hardest! Creativity often leads to a mess. Whether it’s painting or cutting and gluing or using play dough or cooking, we moms are often the ones cleaning up when the creative mood has run its course. However, letting our children express their creativity has many benefits – and you never know how what that creative bent might develop! 2. Giving/Serving. Often children have big, generous hearts. They want to give all their money to a missionary or a worthy charitable cause. I’ve had this happen with one of our daughters, and I have to stop myself from asking, “Are you sure you want to give that much?” as I think she might regret it later. However, I don’t think we ever truly regret giving to others. It’s good for our children to learn the blessing of generosity at an early age. The same goes for serving. If our children want to do something for someone else, let’s say “yes,” even if it means interrupting our schedule or going out of our way to allow them to help others. 3. Reading out loud. If you’ve developed this habit with your children when they’re very young, you may feel there’s no limit to how many books they want to have read to them! You may have to set a book limit or a time limit, but say “yes” to reading to your child as often as you can! 4. Going outside. This one requires some common sense, but when at all possible, let’s say “yes” to our children’s requests to go outside and play. Hopefully they will develop a love of nature and the physical activity that most outside play requires will be good for them – and for you, if you join them! 5. Helping you. Yes, everything will take longer to get done, but let them help you whenever you can. The years in which they will want to do so are short. You can also have some great training times and in-depth discussions while you work side by side. 6. Hold me. Your to-do list may be long, but when your child asks to be held, take advantage of it! 7. Let me do it myself. Safety comes into play, of course, but as much as possible, let your children accomplish tasks by themselves. Whether it’s getting dressed or putting on shoes or cutting their food, teach them how to do it, then let them have at it. If you know they’re going to want to do a time-consuming task themselves, you may have to plan ahead to allow time to accomplish it at their pace. 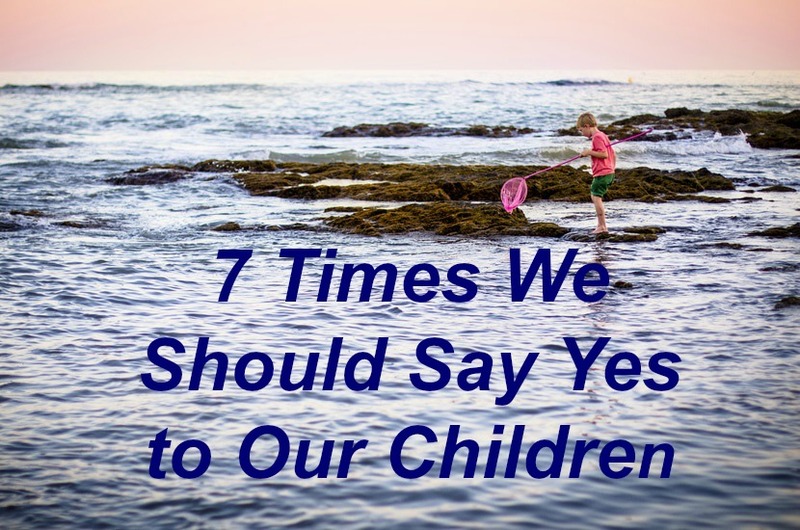 At what other times should we try to say “yes” to our kids? Great list, Tracey. I sometimes have to fight the desire to say no when it should be a yes. Usually my motivation for saying no is selfish which is a clear sign my answer should be yes. Yes – I find my reason for saying "no" is exactly that – what they're asking to do will interrupt my plans or throw me off schedule. Thanks for pointing this out!! I do try to say yes at all of these times, but sometimes, I just can't. The mess isn't worth the time cleaning up; why do they ask to paint five minutes before lunch time? 🙂 But like Janet said, usually I say no because I'm being selfish: selfish with my time. And that's a bad reason. I have been there and know exactly what you mean!!! Even with my kids being older, I still find myself wanting to say "no" if it means I will have to stop what I'm doing to help them. However – also related to them being older – I realize that there are fewer and fewer opportunities to interact with them in these ways, so I'm trying to capitalize on saying "yes" while I can!! You're welcome! Trust your new year is off to a good start! !